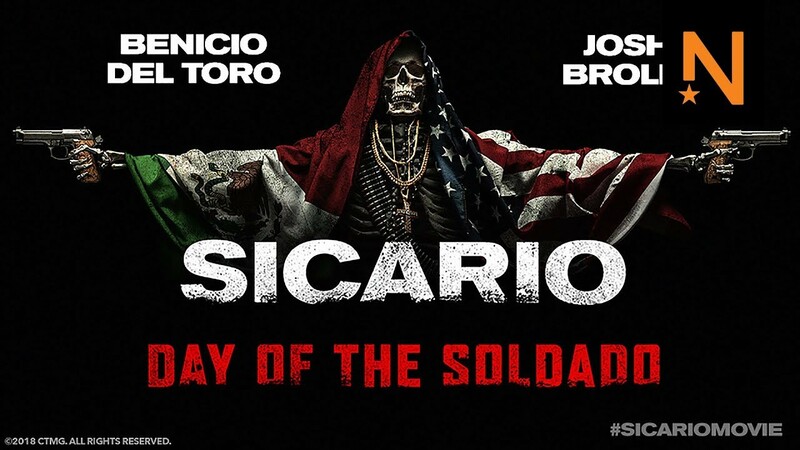 ‘SICARIO: DAY OF THE SOLDADO’ is a sequel to the first “Sicario” movie made in 2015 starring Emily Blunt as an FBI agent battling the brutality of Mexican drug cartels. She’s no longer a part of the new movie which focuses more on her boss then, CIA operative Matt Graver (Josh Brolin), and the defector for the cartels who became her partner, Alejandro (Benicio del Toro). The first movie was directed by Denis Villeneuve. The new one is by an Italian director, Stefano Sollima. The original is told with a dark and ominous tone and that is retained here in the sequel. It starts with illegal immigrants, assisted by human traffickers, trying to cross the U.S.-Mexican border in Texas that ends in terrifying acts of terrorism, including one in a Kansas store that kills a lot of innocent people. The Secretary of Defense (Matthew Modine) calls on Josh Brolin to put a stop on the illegal entrance of suicide bombers and to initiate a war between Mexico’s top drug lords. Brolin then assembles his own team, which includes his former asset, Benicio. They cook up a plan where they kidnap the daughter of a drug kingpin, Carlos Reyes, and make it appear that it’s his top rivals, the Matamoros cartel, who did it. The movie is running along quietly up to the point when the girl that is to be kidnapped is introduced. Isabel (Isabel Moner) makes the movie spring to life right in her first scene where she is shown having a catfight with a classmate who called her a narco whore. The girl is a feisty spitfire and soon after this, she is shown being kidnapped in a daring ambush in the middle of a busy street. It’s Josh and Benicio who lead the team that abduct her but they later make it appear that they are just rescuing he, to get her sympathy. But naturally, things don’t go as they expected since the Mexican police who are supposed to help them turn to be under the payroll of the drug lords themselves. For a while, you don’t seem to know who are really the good guys and the bad guys. There’s even an American mother who helps human smugglers for a fee. 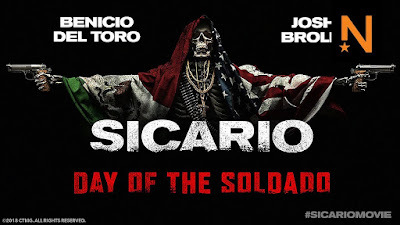 The betrayal prompts the Secretary of State to turn around and disavow any involvement in the massacre of the Mexican cops, leaving Josh and Benicio on their own. We just saw Josh playing Thanos in “Avengers: Infinity War” and as Cable in “Deadpool 2”. He’s at his best here in “Sicario” as he was playing fantasy characters aided by CGI in his past two films. Here, he’s very effective as the world weary operative with a no-nonsense attitude. He is matched every step of the way by Benicio who gives a very cool and calm intepretation of Alejandro, a man whose whole family was killed by the cartels. Benicio becomes the personal protector of the crime lord’s own teenage daughter and he works pretty well on screen with the impressive Isabel Moner as his ward. It recalls similar situations between a man and his unlikely ward we’ve seen before in “Man on Fire” and “Logan”. The caring relationship that develops between him and Isabel provides the touching emotional component in the film. Benicio is in the film’s final scene and his unflappable coolness while confronting a teenage boy who brought him and Isabel so much misery is quite compelling. The movie has some taut, edge-of-your seat scenes that are marked with heightened tension. You don’t have to see the first “Sicario” to appreciate this film, which doesn’t even mention Emily Blunt’s character from the first one. It can definitely stand on its own. The screenwriter, Taylor Sheridan, also wrote the first “Sicario” and two other action-dramas acclaimed as New Westerns, “Hell or High Water” with Chris Pine and “Wind River” with Jeremy Renner. Just like them, there’s moral ambiguity in the way the complex story is developed. For instance, Alejandro can be kind to the girl but he is totally unremorseful in killing a lawyer who sold him out before. The boy who also sold him out then shot him is just trying to earn a living, but the ending where he meets the boy again is open ended and seems to suggest another sequel since Sheridan says that “Sicario” is meant to be a trilogy.